Leading the line for Barcelona as part of the lethal MSN attacking trio with Lionel Messi and Neymar, Luis Suarez has kept his nose clean as of late, and many are forgetting the colour run of misdemeanours he wracked up for both club and country over a torrid four year span. But there are some who will never forgive some of the things the Uruguayan international got up to between, and including, the last two World Cups. 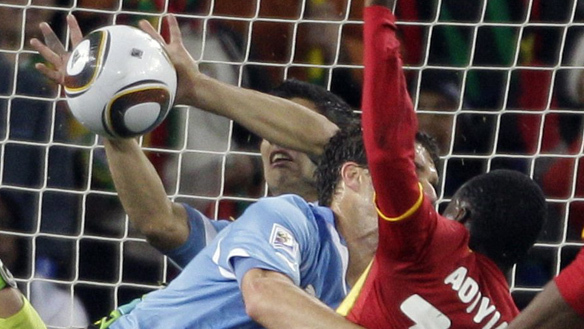 Before he racially abused Manchester United's Patrice Evra and bit not one but three different players, Suarez became a villain across large swathes of Africa when his cynical handball knocked Ghana out of the 2010 World Cup in South Africa. After helping Uruguay through the first round group stage, Suarez scored both goals in a 2-1 round of 16 victory against South Korea with his second goal being particularly memorable. For his efforts he was named Man of the Match. It would be in the Quarter-Final where he would make his most telling contribution to the tournament though. With the score deadlocked at 1–1 at the end of regulation the match went into extra time where a tense thirty minutes witnessed one of the biggest talking points of that year's tournament. Late in extra time, Ghana sent a free kick into the box that Stephen Appiah latched onto and sent goalwards. Suarez blocked the shot on the line, legally, but then when Dominic Adiyiah headed back what looked to be a sure fire winner he used both hands to keep it out. Sent off as the result of his professional foul, the toothy Uruguayan marksman stuck around in the tunnel to see Asamoah Gyan hit the crossbar with the ensuing penalty kick to keep his country's hopes alive. 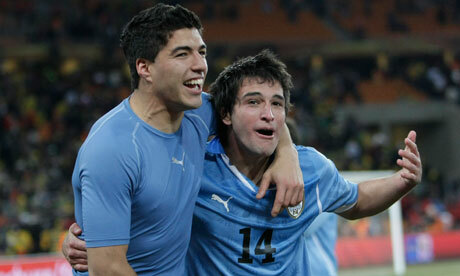 Suarez celebrated wildly, and did so again when his country later secured victory on penalties. Although he saved the match for his side using illegal means and justifiably saw red, it was has slimy actions later in the tunnel and bullish taunts that he would do it again that didn't sit well with neutrals. It would be the first controversial act of many for the talented, but controversial striker.